"405th" redirects here. For the Halo costuming community, see 405th.com. A Company is a UNSC Marine Corps company. 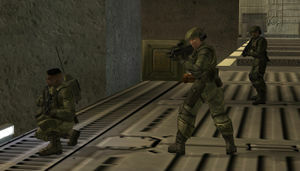 It was among the first UNSC forces to respond to the Covenant's invasion of Mombasa, Kenya during the Battle of Earth. A Company arrived on scene during the Battle of Earth in Mombasa, Kenya on Earth, and went on to fight in the city streets of New Mombasa. They took heavy casualties immediately after landing; the lieutenant commanding an element of the unit's forces in the New Mombasa industrial zone was killed upon arrival. Soon after, Staff Sergeant Banks was placed in charge of a command post in an Mtangulizi Kampuni building which soon became pinned down by heavy Covenant armor. Elements of A Company assisted Spartan John-117 in the destruction of a Scarab that was moving through the city. Surviving members of this unit then traveled to Installation 05 along with John-117 aboard the UNSC In Amber Clad. It is likely all were killed in either the Battle of the Quarantine Zone or, although unlikely, the Fall of High Charity. It is also possible that they were attacked by the Flood as some of the combat forms spilled out on the In Amber Clad. It is likely that A Company was part of E2-BAG/1/7, a battalion that participated in the defense of Mombasa; earlier in the battle, John-117 encountered and fought alongside members of the battalion's Kilo Company.